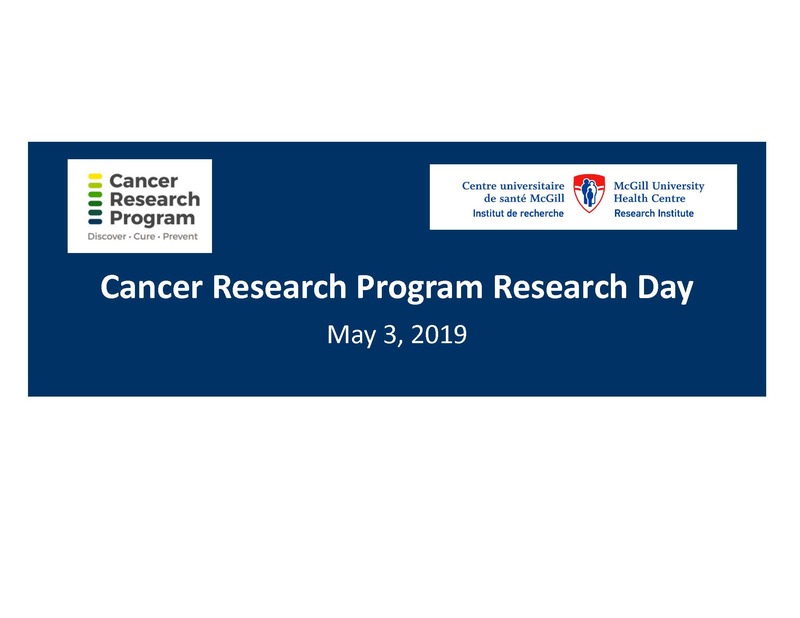 The Cancer Research Program's (CRP) Annual Research Day is organised with the purpose of stimulating scientific discussion and fostering CRP member relationship while celebrating the great cancer research conducted by our members. Importantly, this event represents a good opportunity for the CRP trainees and research staff to share their latest research progress. CRP trainees, postdocs and research staff are invited to submit an abstract for poster and/or oral presentation; only best abstracts will be selected for oral presentations. New this year, we will be holding a 3 Minute Thesis Competition (3MTC) (3 min - one slide to present your research project). Available spots are limited to 8 participants on a first come first serve submission (limit of one student per lab). Interested trainees must submit their presentation title by April 5th. Research day and keynote lecture will be held at the Research Institute of the McGill University Health Centre (RI-MUHC) Auditorium. Registration is required to attend the Research Day. *** Please note that only one submission/presentation by trainee will be accepted. Professional one-piece posters are encouraged but not mandatory. Individual slides printout panels are also accepted. The challenge is to present your research project in an engaging, accessible and compelling way. A single static PowerPoint slide is allowed (no transitions, animations or 'movement').